The political conventions this year were historic for three very important reasons. 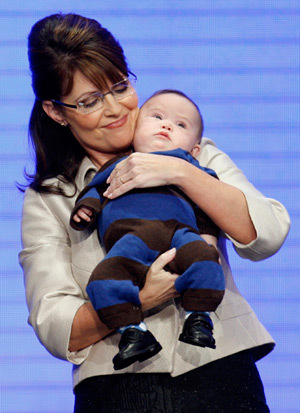 Barack Obama is the first African-American to be nominated for President, Sarah Palin is the first woman nominated as the Republican Vice President and little Trig Paxson Van Palin has become a civil rights leader. Pronounced by his mother as “beautiful” and “perfect” and applauded at center stage of the Republican convention, Trig smashed the chromosomal civil rights barrier. It was all the more moving because of the innocence and indifference of this 4-month-old. It was not always this way. When John F. Kennedy’s younger sister Rosemary was born mentally disabled in 1918, it was treated as a family secret. For decades Rosemary was hidden as a “childhood victim of spinal meningitis.” Joseph Kennedy subjected his daughter to a destructive lobotomy at age 23. It was the remarkable Eunice Kennedy Shriver who talked openly of her sister’s condition in 1962 and went on to found the Special Olympics as a summer camp in her backyard — part of a great social movement of compassion and inclusion. Trig’s moment in the spotlight is a milestone of that movement. And now we have met Trig, who is just like the others, in every way that matters.